Given the fact granite is a natural stone product, it has a timeless aura and appeal that is hard to match. Granite countertops are ideal for heavy use and really take a kitchen to the next level visually, often becoming the centerpiece of the home. Since we buy granite in bulk directly from the quarries, we are able to pass along the savings to our customers. 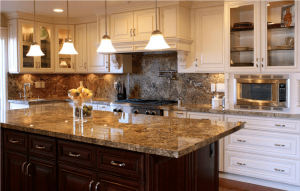 In addition to having better prices, we offer the largest selection of granite countertops in the Tampa Bay area! Tampa, FL 33624. Easy access from Temple Terrace, Carrollwood, Lutz, Town N’ Country, Land O’ Lakes, Wesley Chapel, Brandon, Riverview, Palm Harbor, and Tarpon Springs. Appointments are preferred, but not necessary. We look forward to seeing you! Click here to view some of the granite countertop colors we have to choose from!